As the old saying goes: The scariest phrase in the English language is "I'm from the Government and I'm here to help." I think you probably hit the nail on the head with your comments. The problem probably lies mostly with the safety regs., and red tape that government employees have to follow. The local firemen that are red carded, and have been paid for fighting FS and BLM fires, tell me that their morning briefings take up so much time with safety, etc. that there is no time left in the day to put out the fire. I think everyone there would like to put out the fire, but they are handcuffed with so much BS that stems from liability issues. You have the knowledge and insight of wildland fireifghting that only exceeds Conrad Burns himself. Well Cliff Mason, I don't know how to respond to your comment. I am not sure of the total extent of Conrad Burns knowledge of firefighting so you will have to explain to me what his knowledge is. I know from Conrad's outburst last year, I feel his knowledge is a little lacking but since you somehow think his knowledge of firefighting is important to my memories of a fire you will have to come up with the information for me. We can then compare Conrad's knowledge to my 20+ years of firefighting knowledge and experience, which I will provide, and decide who has the most knowledge and insight. To do this though I would also require that you, Cliff Mason, present your credentials and knowledge of firefighting so that everybody knows that you have the background to judge who has the most knowledge. Why you feel this is necessary, Cliff Mason, I would really like to know. I mean if you have a problem with something I said, please point out the problem and where I am wrong. Then we might be able to engage in a conversation like intelligent people. By throwing a comment out about my knowledge compared to someone else's knowledge of firefighting is not an intelligent way to start a conversation. It seems to me that you have no intelligent point to make but just want to make yourself feel superior by throwing out a comment that has nothing to do with what I said. Intelligent people make real criticism on what is said and don't hide behind comments that are just designed to try to hide the real issue and have nothing to do with what the story is about. Cliff, I would really like to hear where my memories of the fire I had here are wrong and what inspired you to make a comment that has no bearing on my memories or on my feelings of those memories. I did not realize as a blogger memories and feelings weren't allowed. 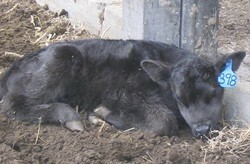 A baby calf from the two year-old heifers trying to stay warm and dry. Taken 2/13/2005.